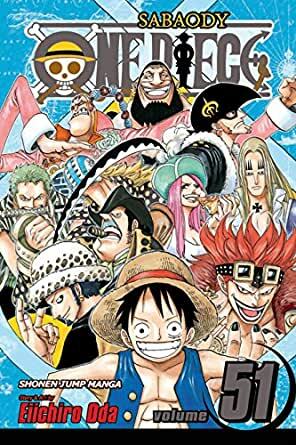 Camie the mermaid offers to take Luffy and the crew to Fish-Man Island if they'll help rescue her boss Hachi from the notorious Flying Fish Riders. Ignoring all of the warning signs (hint: her boss sounds suspiciously like an old enemy! ), the crew agrees to help their mermaid friend, only to end up losing Camie to other kidnappers! Love One Piece! This chapter in particular is one of the series' shining moments. Fantastic graphic novel, Eiichiro Oda is a genius writer and I would recommend this series to EVERYONE! It is a fun story that you can really get in to and everyone that I have ever told about this series has loved it! 5.0 out of 5 starsSupernovas! I like many fans, was excited to hear about the supernovas! I am excited to admit the wait was well worth it and all 11 make fantastic entrances into the OP world. I am excited to learn more and see what happens and this books had me on the edge of my seat! Its a great book! One of the greatest arcs in One Piece. 5 stars.